Fighting 15s has formally completed the purchase of the 40mm ranges formerly made by Southampton-based Flashing Blade, and which Fighting 15s has been keeping in production. The 40mm ranges include Romano-British and Dark Ages Saxons, Ancient Greeks and Skeletons, and Napoleonic Portuguese Cacadores. Over the next few months Fighting 15s will be tightening up the lines, making new moulds where required to ease production headaches, and getting photographs up on the website. Figures in the ranges are reasonably priced at £2.50 per foot figure including VAT. Fighting 15s has reached an agreement with Mark Rowsell of Flashing Blade to buy the 40mm ranges formerly made by the Southampton-based company, and which Fighting 15s has been keeping in production while Mark has been sorting out his life. Buying the 40mm ranges, which include Romano-British and Dark Ages Saxons, Ancient Greeks and Skeletons, and Napoleonic Portuguese Cacadores will allow us to tighten up the lines, make new moulds where required, and look to expanding the ranges. 40mm Children of the Hydra – sorted! 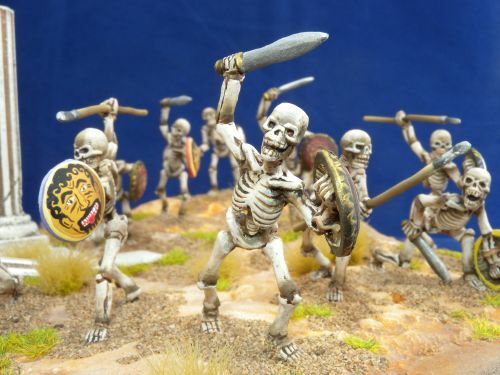 Fighting 15s is making sense of the moulds and inherited stock from Flashing Blade, and is pleased to announce we have sorted out what’s what in the 40mm Children of the Hydra, aka Skeletons. We have photographed the display model, identified its components, re-described the figures in the shop because they didn’t match the list, and finally uploaded the appropriate pictures. All this for just six figures! The skeletons are usually £2.50 each including VAT. A special Children of the Hydra multi-pack allows customers to buy all six different figures for £14 including VAT, a saving of £1. We will have these figures at Salute on Saturday 24 April. Fighting 15s will shortly be turning its attention to the skeletons’ natural gaming partners in the range, the Greeks, and photographing the available models. Fighting 15s is now producing Flashing Blade’s range of 40mm figures under licence. Mark Rowsell of Flashing Blade has had to wind down the business to deal with his illness and its domestic ramifications, and while he gets himself sorted out over the next year or so, Fighting 15s will produce his figures. The old Flashing Blade website and contact details are no longer valid. Flashing Blade’s 40mm ranges include Skeletons (Children of the Hydra), Ancient Greeks, Romano-British, Dark Ages Saxons, and Napoleonic Portuguese cacadores. There is also a range of shield transfers and banners produced by Little Big Men Studios for Flashing Blade. The figures are now available on the Fighting 15s website; the transfers will be added after stock levels have been assessed. Pictures will follow when we can get hold of them or take them ourselves. Prices have had to be adjusted to account for the fact that Fighting 15s is VAT registered. The price of a single 40mm Flashing Blade foot figure is £2.50 (£5.00 for two, when packaged as such) including VAT, and a single mounted figure is £7.00 including VAT. Flashing Blade 40mm figures can be ordered in advance for Salute, and Fighting 15s will have stocks at the show.